A bit of crazy news has hit the internet very recently! 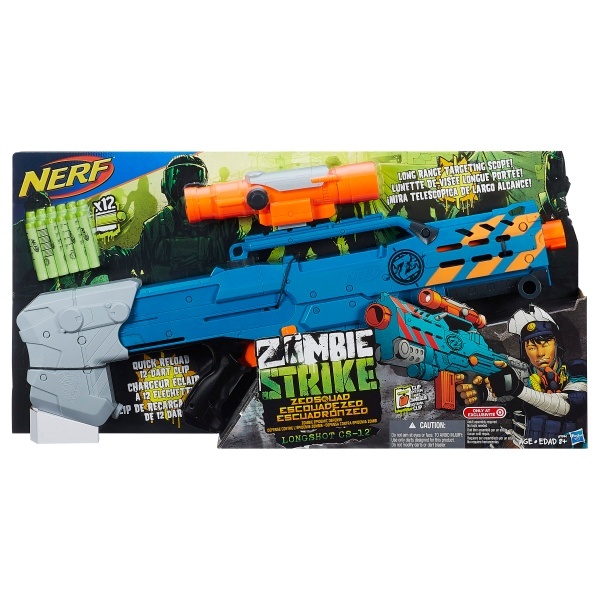 Thanks to a member of my Nerf Facebook group named Ricky, and the UK/German sites S Myth Toys and IE Toys (same retailer) we have a first look at the upcoming Zombie Strike Longshot blaster! Product description can be found below. It will come with 12 darts, a 12 dart mag, and what looks to be the usual scope it came with back when it was released back around 2006/2007. If you would rather listen to the details instead of reading them, you can watch/listen to my video below. The zombie threat is growing bigger every day, and you need a bigger blaster to keep up! 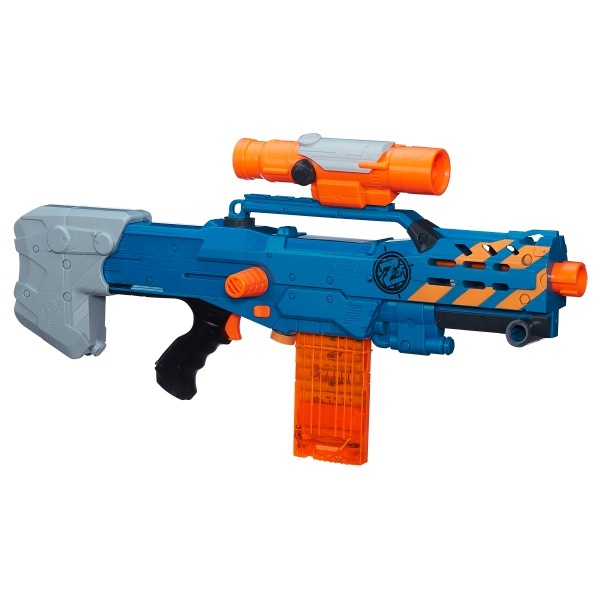 The Longshot CS-12 blaster holds 12 Zombie Strike Darts and has a long-range targeting scope so you can aim with precision to take the zombies out. Load up fast with the Quick Reload clip, press the trigger and sweep the field in the battle against the zombies with the Longshot CS-12 blaster! How looking at the blaster images and box art, there appear to be a few changes with the blaster. First, neither the box nor the description make any range claims. I’m hoping we can at least get this blaster firing Elite Ranges. I would expect Nerf to updated the internals of this blaster since Elite Ranges are the new standard. Also the bipod seems to have been removed from the front. I’m personally digging the dark turquoise colors as well. Also as you can see from the image below, it looks like it will be a Target Exclusive when it hits the states, and is possibly other parts of the world. While people might think that it’s make, the amount of work needed to edit/doctor the image would be a big on the hard side. Also the original art of the guy on the box makes helps make me think that this is indeed real. I’ll be sure to keep you updated as more news of this blaster is revealed! I just bought one, and surprise! It’s the same awful ranges, except now without the cool bipod. AR removal, plunger swap, and spring upgrade are in the works. There’s even the original N-Strike logo still form molded on the stock! Come on Nerf… Well, as always, theres plenty of modding room inside.